Mom hosted us for Christmas dinner on Wednesday, pulling out all the stops and making a fantastic roast turkey (as always). 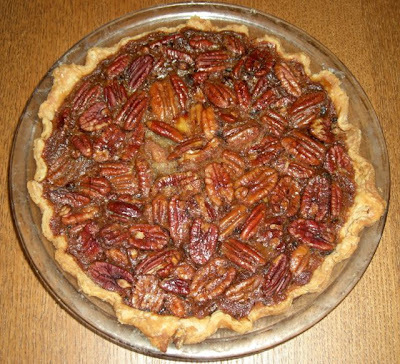 Instead of just the usual desserts, she tried a new recipe for Pecan Pie that called for honey instead of corn syrup. She also used a no fail crust recipe she got from my Aunt Joline. This made for one pretty amazing Pecan Pie. I was too full to taste it on Christmas, but I got to take half the pie home with me. Yay! 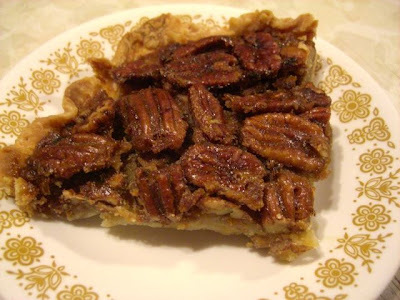 I love a pecan pie and the honey made it taste extra delicious. It was really, really, good! I'll take a large slice, please! Me too! I ate all she gave me. Should have sneaked more...it was so good! Very nice. I don't recall the last time I eat pecan pie. I hadn't had one in a long while, and this one was really spectacular. Really, really good.